The Internet of Things (IoT) has become something of a ubiquitous term in the technology world, growing noticeably over the past year or two. And with the market projections from various research outfits and publications, it’s understandable. Tens of billions of potential things to be connected over the next decade(s) and revenue projections well into the trillions should leave no one surprised that these three letters are popping up in sequence so frequently these days. But there’s an important distinction to make between the Internet of Things as applied to the consumer space—the self-replenishing fridges, the driverless cars, the control of your thermostat from your phone—and the Industrial Internet of Things (IIoT). The addition of that fourth letter alters the term to apply more to the concept of Smart Connected Operations within a plant or production facility to create products and services. Below, we’ll elaborate on this distinction, explain the IIoT opportunity, and how the platform is being created to support IIoT activity. The IoT refers to the network or networks encompassing the use of standard Internet Protocol (IP) technologies to connect people, processes, and things to enable new cyber-physical systems. 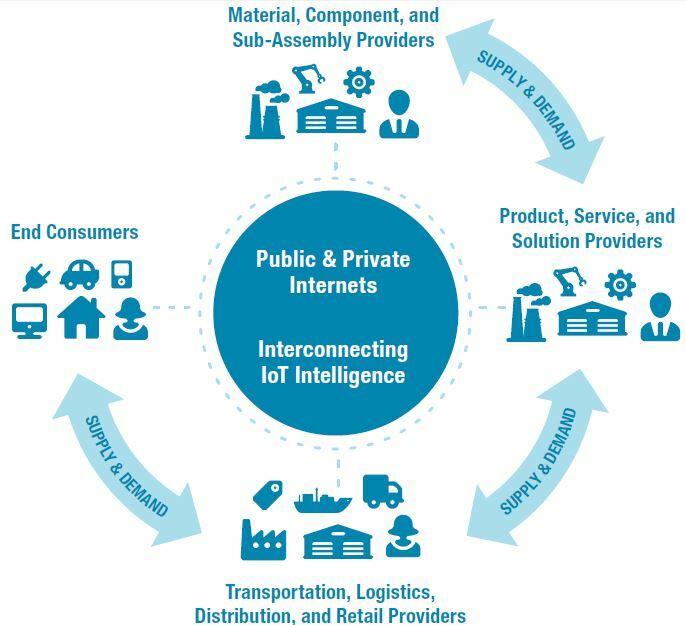 The Industrial IoT should be understood as a subset of the broader IoT, where these connections exist mainly to produce physical goods for the marketplace as well as to maintain the physical assets of production. Today the majority of manufacturing companies have a legacy of information and automation technology solutions that have been implemented over several decades, with most of these solutions built on a mix of open and proprietary communication protocols that were the industry standard at the time of their development. 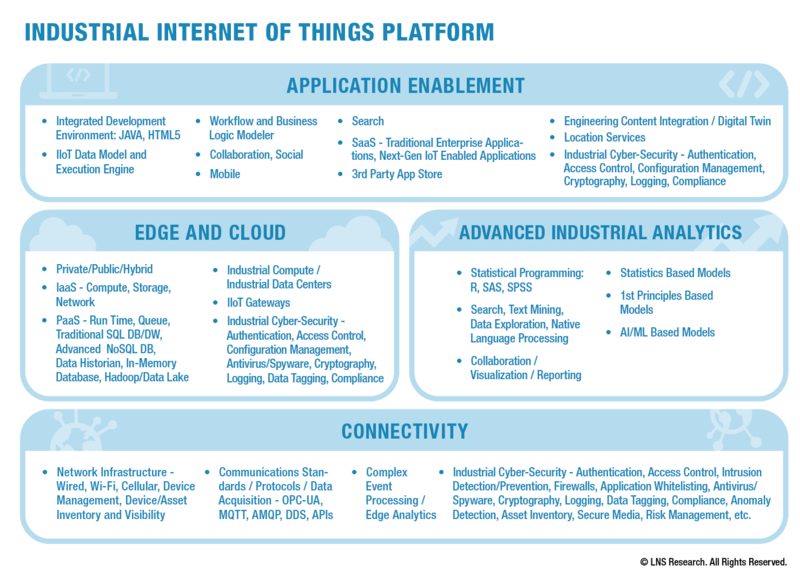 As these systems do not easily interoperate with one another, this communication sticking point is a major roadblock to actually realizing Industrial IoT capabilities, and why the creation of an IIoT Platform that can integrate the information from these legacy systems is necessary. 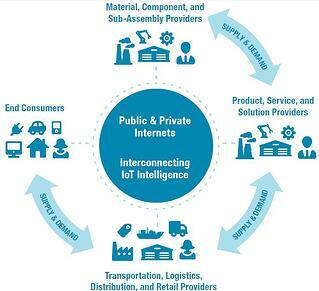 The IIoT Platform is a future looking framework for categorizing the technology capabilities that are necessary to deliver Smart Connected Operations, Smart Connected Assets, and the Smart Connected Enterprise. A growing area of market activity, the progress and development in constructing the IIoT Platform is something we’ll be talking and blogging about frequently as time moves on. Connectivity: This includes all necessary hardware and software to network within the plant and the enterprise, standards for integrating machines, clouds, applications and the technology for quickly and efficiently managing devices, moving data, and triggering events. Application Development: Includes the needed tools for quickly and easily creating new mashup software applications that leverage all other areas of the IIoT platform as well as quickly and easily moving existing legacy applications on top of the platform as well. In these early stages, there is no single vendor that can yet provide capabilities in all four areas, and for now the creation of a viable IIoT platform will come through an ecosystem of vendors, most likely the large and established players in both the Information and Automation technology spaces. How Do I Get on the Fast Track for Building this IIoT Platform for Success?